The Doctors TV Show did a segment on 5 Minute Fixes, and Dr Andrew Ordon showed some interesting Beauty Home Remedies, including this Bagel Head Conditioner Hair Remedy for shiny, silky, beautiful hair. The Drs TV Show got the recipe from Kym Douglas, author of The Beauty Cookbook: 200 Recipes to Make Your Kitchen Your Spa — for Your Face, Your Body and Your Hair , which I will definitely be reading and reviewing shortly! 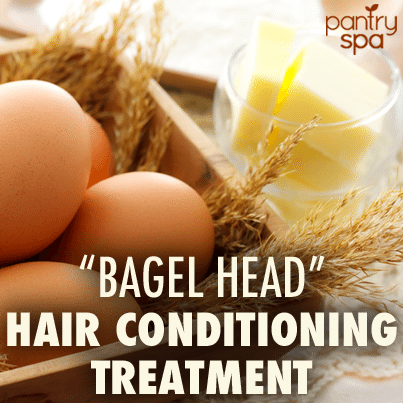 Why does this Bagel Hair Conditioner work? The egg yolks have vitamin a (which helps prevent dandruff), vitamin d (which helps with hair growth), vitamin e (which increases the amount of oxygen absorbed) and b vitamins (which improve your blood circulation). The fatty acids also help to improve your hair’s shine and to make it easier to manage. This Hair Home Remedy is great for people with processed hair, dandruff, psoriasis, hair loss or a flaky scalp.